There is a lot to unpack and I can’t tell how much of it is intentional? But I like it?? In Camelot of the extreme past (1000 years ago, ‘before the Age of Arthur’, LOLZ) Merlin found the Holy Grail and drinking it gave him magic and immortality. He touched the sand he sat on and the Camelot we knew before Evil Arthur turned it into the Camelot we know now appeared. 500 years later he still lived there, using light magic to heal and help. He meets Nimue, a young woman whose village was destroyed by a medieval masked supervillain. Merlin can’t read Nimue’s future (because True Love?) 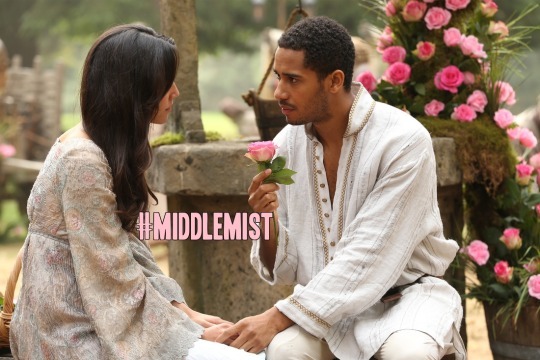 and when she asks for revenge his eyes fall because Merlin refuses to use the Dark Side of the Force — but her revenge is to grow a crop of #Middlemist flowers from the seeds she rescued from her burnt village which I assume was called Middlemist. Merlin and Nimue fall in love. But there’s the problem of Merlin’s immortality. Nimue suggests she also drink from the Grail but Merlin decides to refashion the Grail into a sword instead, a sword that will have the power to cut the magic and immortality out of him (and the world?) forever. They head off to get the required magic fire — the same that the gods gave to Prometheus long long ago (various references to religion abound here but it’s not discussed)— from a hilltop that is (in)conveniently near Nimue’s destroyed village. Nimue is overwhelmed by the destruction and secretly drinks from the Grail which makes her magic and immortal so when the masked super villain kills her it doesn’t stick, she pops up, rips his heart out of his chest and despite Merlin’s impassioned pleas to stop, crushes it into dust. Nimue becomes the first Dark One. Merlin takes the repurposed Grail, now Excalibur — split into two pieces during the battle with the bad guy — puts the larger piece in a stone and attaches the smaller piece to Nimue, now the Dark One,’s soul. But as we already know he can’t use it to kill her so he gets stuck in a tree for 500 years. In Camelot of the Recent Past, Merlin takes Emma on a journey to get a Spark from the fire of Prometheus, still at the top of a hill past Nimue’s village. He sees two outcomes — either they’ll successfully get the Spark (aside: every time they say spark I imagine Figment) or Emma will give in to the Dark Side and kill him. Emma is not feeling very confident so Hook gives her a ring to remind her that she’s Emma, not the Dark One, and he believes in her. It’s not an engagement ring (right), just something that kept him alive all these years (do we know that story? do I care? Not overly). Feather in her trunk (she fiddles with it all episode, which is cute) Emma and Merlin make their way up to the spark. MY HEART. I tell myself “I have never been nothing” literally every day. I usually follow up with “I am the blood of the dragon” but now Emma AND Daenerys can be my charms. And it’s significant and beautiful that Emma — the lost girl — says it. Character development FTW. Anyway, Emma avoids the temptation of the Dark Side, gets the Spark and heads back down the hill with Merlin. Unfortunately the rest of their team is less successful. Regina, Robin, Hook, Snow and Charming were tasked with getting Excalibur from Arthur. My first question is why isn’t Lancelot there? He was freed last week? I must have missed something. My second question is why is Zelena there? She’s proven to be as likely to double cross you as Rumple. But Zelena is the one who comes up with a way into the castle and the crew decide to trust her because they never learn and/or believe that Regina’s magic demagicing bracelet will keep her in check despite it not working out any of the other times they used it. Snow is left guarding Zelena and she fails spectacularly, and the other four walk into Z and Arthur’s trap. Not only are they working together (how did they connect if she was mute the entire time???) Arthur gets Zelena to cast the spell Merlin used to bind the dagger to the Dark One to bind the broken Excalibur to Merlin, whisking him away from Emma right in the middle of a no doubt adorable Henry story and into their drama. Now Arthur and Zelena have Excalibur and Merlin, and Emma the Dark One is alone in the woods with both the Dagger and the Spark. Not cool. 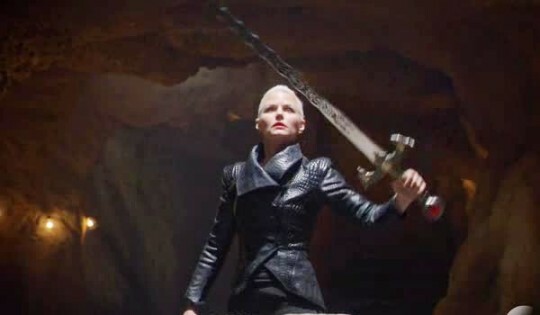 In Storybrooke of the Present, Emma has the Dagger, the Spark, and the newly released broken Excalibur. She briefly hesitates because Merlin definitely told her not to do this when she was just a kid but Nimue, Rumple, and a cavernful of Dark Ones tell her to ignore that and take what is hers. OK. SO. Here is what is very interesting to me. Arthur has a tantrum about Merlin promising him a life of power and prestige that never appeared. He started out as a kid with no family name and he is now KING, married to the woman he’s loved all his life, living in a huge castle, with an army of knights to command and access to all manner of magic — exactly what part of Merlin’s prophecy has not come true is something of a mystery. Maybe he’s mad his power is precarious because he pretended the sword was whole all along. Maybe he’s mad he had to use magic to keep his wife. But to that I say: YOU CHOSE TO DO IT. In point of fact EVERYTHING Arthur is upset about can be traced back to his own choices. He’s mad because the world has not responded to his choices the way he wants it to. It’s textbook Male Tears. Meanwhile Emma is on a parallel journey…But she’s mad because she feels like a pawn in her own life. Like she doesn’t get choices, everyone and everything in her life is predestined and every time she decides to act on her own the result is MORE forces popping up to try and control her story (Henry and Regina in S1, August and Neal in S2, basically everyone in S3, Ingrid and the Author in S4, now an army of Dark Ones vs the memory of Merlin in S5). Emma wants agency and autonomy — that’s what Dark Swan is all about — but even all the power of the Dark One is just another cage she was fated to inhabit. Contrasted with Arthur it’s an very interesting story about male privilege. Meanwhile meanwhile Merlin has had to say twice now that wizards can look like him. It’s starting to come across as Once Upon a Time’s pointed response to the new Harry Potter films having no prominent wizards of color (it’s not, I mean OUAT has its own issues with race, but due to that discussion it’s coming across). Arthur’s White Male Privilege is even more apparent when we consider the characters closest to him in the story: Guinevere, Lancelot, and Merlin are all non-white. In the traditional legend, Arthur is typically seen as the most pure of the group, surrounded by people who disappoint and betray him. Here that is his perception, but not necessarily the audience’s. Certainly not mine. Arthur is an entitled white boy whining that people aren’t treating him fairly when in reality they are all, according to the ON SCREEN TEXT, literally living in the ‘age of Arthur’. He’s banished and imprisoned Lancelot, brainwashed Guinevere, and enslaved Merlin to do his bidding. Arthur has ALL the power and still feels justified in his persecution complex. Final observation: Emma’s tattoo is prominent in the last scene (and notably a flower like those ubiquitous #Middlemists that were also the title screen). It’s a message, I’m certain, but what?